I used to listen to a morning show that I really liked, but 40 minutes a day got too much for me. I got bored of the topics, and so I set about trying to find something else to occupy my mind in the mornings. I then decided to get some books on tape! I am very fortunate to have both a cassette player and a CD player in my car, so I can check out pretty much all of the audio books at the library. 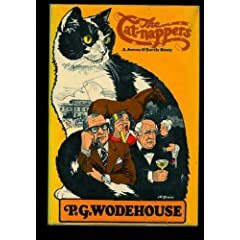 Earlier this week, I picked up a book unknown to me, entitled “The Cat-Nappers“, by P. G. Wodehouse. Apparently it’s the last book in a very popular series about a man name Bertie Wooster and his valet Jeeves. If you don’t recognize this book, you may know it by its British title, “Aunts Aren’t Gentlemen”. I really enjoyed this book, and I am eager to read the others in the series! There are some great one-liners, which I would repeat here but I’ve forgotten them due to me driving at the time.